Here we are again, another month drawing to a close, and what a month it has been. In some ways, it seems like it has flown by, but with how much has happened, July 1 feels ages ago. We had the wonderful visit with grandparents and the weird Tour de Fleece. Las Vegas was filled with amazing experiences crammed into just a few days, and perhaps it was more than the flying that left my head swimming. My mom's dog venture has entered a new phase. Construction began on the dogs' new home, and Poppy had two puppies. Inspiration from Nora's Citron had me digging through the stash to find a missing ball of yarn to knit one of my own. 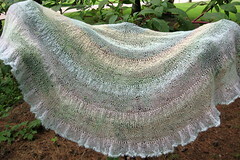 I love my new shawl, and wish I could photograph it better to show it to you all. Knitting it was a perfect companion for this month, as it did not require too much attention, and the cobweb weight yarn I used (Jojoland Harmony) kept it compact for on the go knitting, and light enough so that it was comfortable to knit in the hot weather. Speaking of the hot weather, I have been amazed at how little it has bothered me. Don't get me wrong, I do dislike the heat, but it has not hurt me the way it usually does. I was surprised by how well I held up in Vegas, even when the thermometer read 116F. Somehow, in my mind, it is nearly Fall, and time to start cold weather knits. Perhaps it is my weird working for me for now, but whatever it is, I am grateful that I am holding up so well with the hot. We definitely have begun thinking about when it really will be almost Fall, as it is time for working out the details for probable travels in September. It will be another new-to-me experience. It looks like we will be in NYC for a few days, and we are on the verge of information overload trying to decide what we will do in the time we are there. Whatever happens next, I have plenty of knitting and spinning to keep me company. This week, Carole asks us to write about things to do instead of watching television. Of course, many of these things can be done while the tv is going, and I am writing this list while watching a show. Still, we increase the quality of the experience of most any activity when it is the sole focus. The 2010 Tour de Fleece has come to an end. Around the world, lint rollers are cleaning up the stray bits of fluff, and new skeins of handspun wonder whether they will become something else, or if they will continue to be valued because they are yarn. The TdF was different this year, but I still had fun. I was a bit disappointed that it became necessary to change the way they awarded the daily prizes, but completely understand why they made the decision. I really enjoyed going through the threads and voting last year. Still, I do not think that is really what made it so odd this time, and the prizes, while very nice and generous, are beside the point. July is usually a bit of a weird(er) month for me every year. So, what all did I make during the Tour? 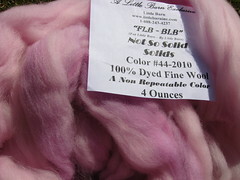 I spun some of the pink wool that I got earlier this month. I spun a bit of Shetland wool, and that was very nice. There is still more to come from both of those. However, a different spinning experience was star of the Tour for me. It was the one goal I set for myself, and it was a challenge, but I finished with the fiber I received for my anniversary last year. Because it was a gift from Bruce, that made it special, and that is why I decided to take my time with it on a spindle. I did not expect to take this long, but I have many memories to go along with my new yarn. During last year's TdF, it came with us to the hospital for the isolation room experience. 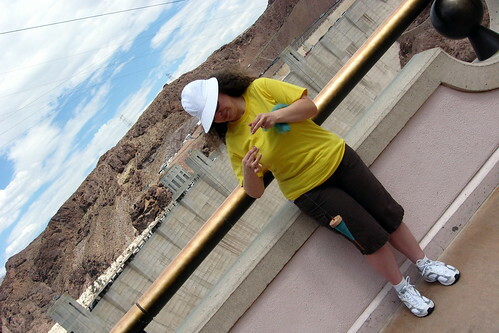 This year, it came along on our Vegas adventure, and I got to spin it atop the Hoover Dam. It shared plain, quiet moments, too. When I finished with the singles, I had to decide whether I wanted to ply on the spindle or a wheel. Kiwi won, and she was right. Fitting it all back on Little Si would have probably been too much. Anyway, I loved plying. It would seem that all of the plying mojo is vacationing here. I kept watching The Gentle Art of Plying, and it is wonderful and inspiring. After that, it was time to skein, wash, dry, and re-skein, and sitting back and enjoying my new yarn. I wonder what it will become. Touring the Hoover Dam topped the list of must-do things for Bruce while we were in Las Vegas. It was a fascinating and educational adventure, but I wanted to do more with the experience. 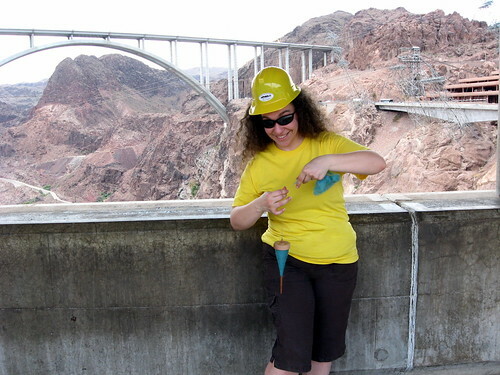 I put my drop spindle, fiber, and a yellow shirt in a bag, and hoped everything would work out something close to what I envisioned. When I was warming up (for the spindling, that is) in line inside waiting for the guided tour to begin, I believe some people tried to sneak pictures, others stared, but there were few questions. A curious adult prodded a child to ask me about what I was doing. It seems that once most people learn what I am doing, they experience and odd combination of disappointed, bored, and confused. 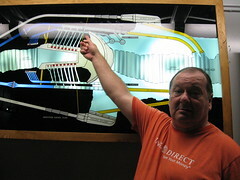 Bruce, however, ever enthusiastic and supportive, urged me to give more details than most people ever wanted to hear. By the time he is trying to get me to describe the Tour de Fleece, they are beginning to look for the nearest exit. Anyway, none of that matters, as my purpose was to entertain and amuse myself, and that I did. While it has been a number of years since I went camping, (we are conveniently forgetting that fiasco 2 1/2 years ago) it used to be a regular happening through my childhood, and I do remember some of the necessities. I am not quite sure what the start-to-finish time is in on this, but I sure am glad it is done. My niece begged to make a felted purse a few years ago, so I bought the yarn for her and helped her with the pattern and some of the knitting. From time to time, she would knit it at our home or during family gatherings, but it has mainly been in a state of hibernation. Occasionally, she felt that the burden of knitting it was just too great, but felt great anguish over not having a finished purse. After Thanksgiving dinner last year, she tried to teach others to knit in an attempt to get someone else to finish the last twelve inches of i-cord. Everything went back in the bag and waited for her. Sometimes she would ask to come over to work on her purse, and then forget about it twenty minutes later. One day last week she asked again, and again, we told her that would be fine. You could have knocked us over with a feather when she called the following day. In short order, she finished those last stitches, I attached the handle, and it was in the washing machine felting away. She happily posed for the photo and then took her new purse home, and the next part of the journey belongs to her. Oh, Land Legs, Where Are You? We are back from our travels, and it was something else. Nearly everything has been put away, and most of the laundry is done (from the trip, that is), the grass is cut ( we will not mention the weeds), and beginnings of bread are in progress. While waiting for the swimmy head to stop, how about some Ten on Tuesday? This time it is the things we like about where we live, and I do not need a list of ten to describe just why I am glad to have found this place. This is where I found my Bruce! I will be back later with tales of spinning and knitting. It has been very busy over the past week. My grandparents were in town to visit and celebrate. We had the big gathering on the 4th of July. Food, fun, family, and fireworks made it a great day. The celebration began a bit shakily, as in an effort to be accommodating and not be bossy, we can be a bit vague about the details, but we quickly got on track and had a wonderful time. While getting together with far-away family is already a reason to party, we had other occasions to commemorate. This year marked my grandparents' 60th wedding anniversary, and my grandfather's 80th birthday. Of course, it was not all about the big party. Quieter times spent with just a few of us at a time gave us special moments. Grandma knits and spins, so we spent more than a little time discussing those topics. We had a fiber acquisition adventure and discussed patterns and techniques. Grandpa remains perplexed as to why one would knit socks two-at-a-time, and I remain perplexed as to why he feels the need to keep questioning us about it. It was busy, intense, fun, and occasionally stressful, but we managed to relax enough to enjoy our time together. We even got over ourselves enough to pose for a group photo without hysterics or drama.